Lleyton Hewitt laughed off Bernard Tomic's comments after the 26-year-old's scathing attack on the Australia Davis Cup captain. Tomic claimed none of the Australia players like Hewitt and accused the two-time grand slam champion of a conflict of interests. He crashed out of the Australian Open with a straight-sets defeat to Marin Cilic on the first day of his home grand slam, but made his presence felt in a startling news conference. But Hewitt dismissed the criticism on Tuesday, telling Channel Nine: "I had a bit of a laugh actually. "It's kind of Bernie being Bernie, especially after a loss last night and going in and complaining about a few things so for me, I just kind of laugh it off and move forward and obviously, working with so many of the guys as well so I'm still excited. "The disappointing thing, the Aussies had such a great day yesterday on the men's and women's side and it probably got overshadowed by Bernie's comments." 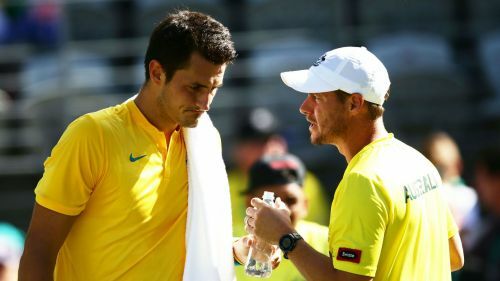 Tomic called for Hewitt to be removed as Davis Cup skipper and accused him of abusing the wildcard system for his own financial gain. Tomic said: "I think, to be honest, we have a lot of issues that not a lot of players are happy about. I think we all know who those players are; myself, [Thanasi] Kokkinakis, [Nick] Kyrgios. "I think once that sort of gets resolved, we'll see. I stand by my call from a couple of years ago, I knew stuff was wrong in the Davis Cup and now guys like Kokkinakis and Nick are not playing as well because they have issues with some people there. "Hopefully that can be arranged and the best players of Australia can play Davis Cup for sure." Tomic stated he wants to return to Davis Cup action, but not with Hewitt as skipper. "It's all Lleyton. I'm going to say honestly, no one likes him anymore. He's doing the wrong thing. He's playing all these matches, I thought he's retired." he added. "I did a little bit of work with him a couple of years ago, he used to hate Tennis Australia, it's weird, now he loves them. "I guess he's using them for other things and resources... and for his pay cheque." Tomic continued: "Kokkinakis, Kyrgios... we don't want to play anymore because he's ruined the system. Go away, literally, if he's retired why are you still in tennis? Why do you still play these doubles tournaments and stuff? "It's funny all these guys who have got wildcards are under his system, I think like Bolty [Alex Bolt] and these guys, [Marc] Polmans, Jordan Thompson - they are all under his wing so he gets a percentage of that, so that's a conflict of interest, I think that's terrible. "It's wrong if he's using the system of Tennis Australia and then he's in Davis Cup and he's doing the wrong thing and everyone's leaving. We don't want to play anymore, so I hope he can get moved and we can go back to having a good captain."